Shari and Dave first met in the summer of 1991, crossing paths as performing blues musicians: Shari was the partner of harmonica legend, Madcat Ruth, (Madcat & Kane), while Dave was leading the electric blues band, Big Dave and the Ultrasonics. A happy marriage, thousands of miles of touring, and twenty years later, they’ve recorded their first CD as a duo. 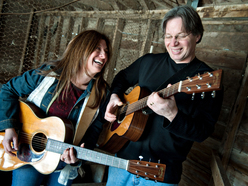 As an acoustic blues duo, Shari and Dave throw a four handed guitar party of original and time-honored blues, gospel, swing and ragtime. Steeped in Dave’s smoky vocals, percussive rhythm and innovative lead lines, Shari’s crisp picking style, rootsy leads, and stinging slidework, their music has been described as “street swing and stomp blues,” – like a testament to sounds once heard on the streets of Harlem, the juke joints of Mississippi, or from the jug bands of Memphis. Shari Kane started playing guitar at the age of five. By the early 1970′s she had become a devoted blues fan, and learned how to play fingerstyle blues on the acoustic guitar. When she was sixteen, she began teaching guitar. She continues to teach, offering workshops in many of the cities where she performs. Dave Steele first began performing as a barroom acoustic solo guitarist and singer while attending Allegheny College in Northwest Pennsylvania in the 1970’s. During the 80’s, Steele expanded his interest to electric blues, as a founding member of the Zipper City Blues Band. After seven years as a popular regional act, Steele moved to Ann Arbor, Michigan where he formed and led the popular blues band Big Dave and the Ultrasonics. The band featured his big-voiced singing and sly lead guitar work as they swung throughout the U.S. and Canada 150 nights a year, regularly lighting up blues clubs like Buddy Guy’s Legends and the Zoo Bar, while making main stage appearances at festivals like the Montreal Jazz Fest and repeat performances at Portland Waterfront Blues Festival. After four recordings, (the final one on the Burnside label,) the Ultrasonics disbanded. Steele took a break from performing at the turn on the century, but continued to play at home with Shari. Steele brings a basket of guitar influences to the partnership- single note lines inspired by B. B. King and Charlie Christian, acoustic ragtime and blues fingerpicking, and rhythm guitar, ala Count Basie accompanist Freddie Green – that mesh seamlessly with his wife’s dynamic fingerstyle and slide playing.